Wild Too has shown its seaworthieness crossing the mediterenean the past month. The boat is much more spaceious inside compared to Wild One with its for double bedrooms with one bathroom each and its 4 single bunks. The equipment we installed (watermaker, solarpanels, inverter, teacooker, Spinaker and Genaker) worked well. Our baby doughter Emilia loved the gentle rocking in her baby cabin and slept better than ever. Malta was wonderful – two very nice crew joined and we freedove a different cave every day and spent the nights in the most incredible anchorages, mostly in Gozo – for example Dwejra Bay - a crater filled with water and only a small entrance to the sea. On our way to Malorca 3 experianced and also very nice sailors joined and we had the chance to optimize the set up of the Genaker sail for the atlantic passages. Lots of Cave diving at the north side of Malorca again and the icecream of Port Soller plus some good friends from home visiting were the highlights in that week. Over the atlantic to the caribean I will sail Wild Too with crew and Stephie and Emilia will join in Martinique on the 11. of December. The installation of the watermaker has to be finished in the few days prior to our departure. The NT47 is a performant cruising cat about the same size of Wild One but much more comfortable. We have 4 double bedrooms with 4 seperate bathrooms and toilets! The deck is of gelcoat and not so sensitive for scratches like on Wild One. There is a large watermaker producing 100l/h freshwater – the never ending care to preserve freshwater has an end too. We will have a new scuba compressor and our tanks on bord again. Although it is more heavy as Wild One the Nautitech can still cruise with 10kn average. We will have 2 Genakers 160m2heavy and 180m2 light and a 180m2 Spi which will push us over the atlantic. We plan to start from Croatia 7th of Mai and sail via Malta and the Balearic Islands to Marocco. Stopovers with diving, snorkeling and island exploring are planned in Malta and Mallorcas scenic north coast. Beginning of April we started our Atlantic Crossing from Bahamas to Bermudas and arrived safely after only 7 days. The passage was interesting from a sailing perspective since we had almost every possible wind. Bermudas George Town is Unesco protected and from afar you see that all roofs are white. Every house has its own water collection system on the roofs. We discovered the islands many fortresses and a old bunker system we sneaked into. Diving is were interesting – we found a cave - system called cathedral and dove some of the 400 wrecks – many of them with mooring buoys for diving. If it were not our time schedule we have to stick to we would have loved to stay longer. Tomorrow we leave to the Acores Islands. We will arrive in Flores at latest on the 1st of May. A low pressure system right above the Bermudas moving east will push us right to our next destination – only 1600nm to go. I can not wait to reach Flores with its over 100m high waterfalls in middle of volcanic hills full of flowers , the picturesque houses and the friendly people. It is two weeks we are sailing in the Bahamas now. Cool stuff to discover and explore. At Allen Cay we visited the everyelse extinct Exuma Iguanans, we did lots of freediving at the wrecks west of New Providence and swam with the sharks at the tongue of the ocean. (Which unfortunately are feed by dive operators and scary curious.) Highlight so far was a dive into the lost blue hole – a colapsed underwater cave 100m deep in the middle of the only 5 m deep Bahama bank. Navigating through the shallow turquise waters is beautiful but something I had to get used too. People are super friendly despite the endless tourists arriving on their cruiseships in Nassau. At last I found time to write a view lines. We were so busy sailing from one caribean island to the next. In total 13 countries in the last 2 month! Now we arrived safely at the Turks and Caycos Islands – the eastern end of the Bahamas island chain and enjoy the extremly good visibility underwater and the marinelife here. The variety of impressions we gathered during our 2 month stay in the caribean is huge – close up whale sightings in the Domenican Republic, the perfect kitesurfspot in Martinique, Wreck Diving in Guadeloupe, Islandhopping and beachlife with a 1000 anchorages in the BVIs, turquoise water in the tobago keys, adventorous hiking tours to the boiling lake and waterfalls in Domenica, old ruins and fortresses in Antigua and secluded island community in Barbuda. We appreciated the shopping opportunities and the infrastructure of the french islands Martinique, Guadeloupe and St Martin. The gust of one rain cloud unfortunately ripped our small genaker apart, but so far this is our only damage. It was great to meet Anne, al long time crew of Wild One at here home in the DR – she helped us to manage the otherwise complicated and expansive check in procedure there. The caribean is full of adventures so that I planned to go back there with Wild One next year from Nov to April. I hope you had a good start into 2016. We arrived well in the Caribean after a 5500 mile sail with stopovers in St. Helena, Brazil and French Guyana. Fortunately no damages. The first leg from Capetown to St. Helena was very little wind and we ha lots of opportunities to test the new 200m2 Genaker. Finally the tradewinds came through after we left St. Helena and we made our daily 180 miles with the 160m2 Spinaker only. From time to time fish and a lot of sun. Although we could not stop for long in St. Helena the locals in St. Helena showed us the house of Napolean and we joined a nice BBQ in the evening. Natal in Brazil was more then pleasant with a nice YC situated in a riverarm. Checking in and out a day job though. Our stop in Jericoa (Top Brazil Kitesurfspot) an adventure due to breaking waves on the beach (surfers left and right of our anchorage) Still we managed to swim ashore for our Xmas Caipirinha and a little Kitesurfing in my case. Ile Salut in French Guyana was crowded with fantastic animals like monkeys, parrots, iguanas and others. 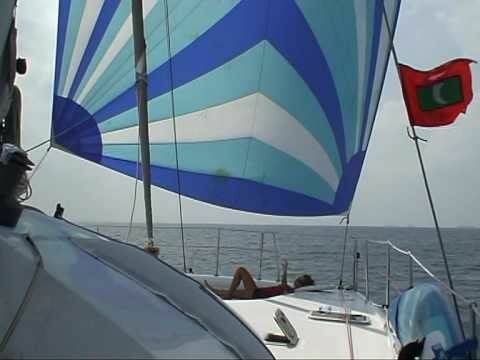 or https://www.youtube.com/watch?v=SVsXZwM1tr8&list=PLQp8FoQ4t-lXXg9-lt5k_7g4LcaC2yd6p&index=2 Wild One sailing with Delos. After 3 nice weeks at home I returned to the boat. Today a windy morning in Capetown. We (Kathi, Moritz, Thomasz and me) are going to leave today over the atlantic to Brazil and then to the Caribean. The boat is fully stocked and prepaired for the 3300mile sail to Brazil. Maybe we see us on one of theese legs or if you come anyway I am looking forward to see you soon. I am looking forward to get into the warmer weather of the tropics again. St. Helena, the island were Napoleon was exiled will be our next stop in about 10 days. For 3 weeks we are in south Africa now and enjoy the crazy adventures with the stunning Wild Live of this country. Close to Richardsbay is one of he better game parks in South Africa and we saw Elephants, Giraffes, Hypos, Rhinos and other wild live. First was a yellowfintuna – 2meters long – we lost it before we could gaff him. And the 3rd fish we did not even see – it must have been 3 m or bigger – we fought 1,5h but gave up at the end. While we were fishing a smaller cat capsized only 10 miles from us. The crew could be rescued the next day in their life raft. He must have not reefed in time because the waves were not that bad. Once again I felt happy to own Wild One – due to her size and design we never felt a critical situation once. Our stopovers in Port Elizabeth, St. Francis and Mosselbay, were we waited for the dangerous south westerly winds to pass were very relaxing. While sailing we constantly saw whales – it must have been more than 20 sightings of humpback whales so far. Right off Port St Francis a whale kept breaching (jumping out of the water) only 50 meters from the boat – we could make the most incredible photos. Other whales kept banging their 3meter long fins in the water. Once at night the whole crew woke up and we thought there is a problem with the rigging because of the strange and monotonous noises. A view minutes later we saw the real reason – a giant whale breathed right behind the boat. It must have accompanied us close by for a long time. Only a view days and we reach Capetown. Our trip continues 27th of November to Brazil. Our Madagaskar tour is super cool so far, we swam with whales, nice diving with Manta Rays and giant groupers, kitesurfing in Diego Suarez, motocross in Nosy Be, unique Wildlife in Lokombe and Masoala parc and rock climbing with our friends from SV Delos on my favorite place Nosy Hara! La Reunion is French and pretty developed. The real secret lies hidden in the mountains. We managed to leave the boat on a mooring and rent a car to do the most beatiful hiking tours. We did not dive due to the many shark attacks they have there. weitere 2 Wochen in Mauritius mit Wild One. Nun sind wir unterwegs nach Reunion. Highlights waren grosse Wasserfälle, 7 coloured earth, wonderful mountainlandscape with vulcanic peaks, cool kitesurfing, good softicecream and 2 nice divespots - cathedral and Stella Maru a wreck. Mid of May we left Australia mainland and have arrived now in the Indian Ocean at Christmas Island. This is also the place were I meet the Lattidude of Thailand, which I left end of 2010. On our way to Christmas Island we made a stopover at Ashmore Reef were we found Nautilus Shells at the beach. The watercolours of the shalow lagoon were remarkeable. Christmas island impressed us with its huge population of robber crabs, best coral I ever seen even on the anchorage and remarkable hiking trials. We explored a cave full of Stalagmites and had wonderful dives in the cristal clear water at the drop off right infront of the anchorage which is desending to 1000m! We tried the open air cinema but the beamer broke down unfortunately. Highlight were Chris and Jess, two young fotographers who took us around the island with teir car and showed us the highlights like blow holes, a waterfall and the main population of Robber crabs and yellow footed boobies in the junggle. End of May we continued to Cocos Keeling, the furthermost Australien offshore island. 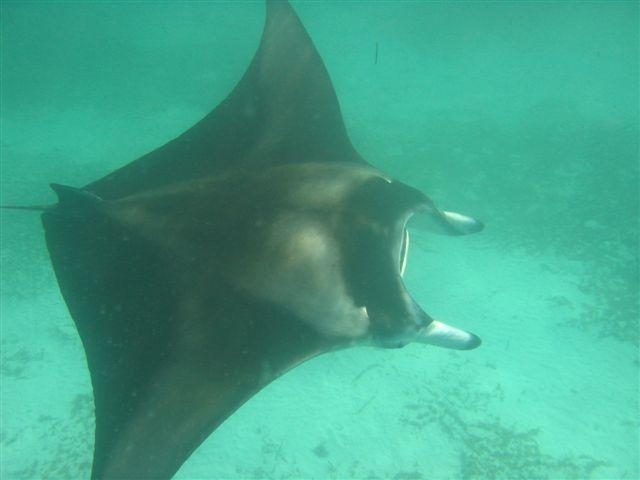 The dives there on the outer reef were unforgetable wit a mantaray sighting on each dive. In the Lagoon I could swim with dolphins! The anchorage itself must have been the most beautiful I ever been at and is a good spot to say good bye from Australia. The 2000 miles crossing of the Indian Ocean from Cocos to Rodriquez was more than pleasant. In only 10 days I arrived in Rodriquez already with the trade winds speeding us up to constant 10kn. On our way from Cairns to Darwin we found some unique places – at uninhabited Wessel Island we found an old grave (a skeletton with a spear), saw crocodiles in the Adeleide River near Darwin right off the anchorage and had really incredible dives at the Barrierreef near Lizard island. We dove with Giant Groupers for whom I always had a special affaction. Lighthouse Bombie with Giant Groupers, Jackfish and Baracuda swarms, turtles and seasnakes was one of my best dives ever. After 2 month at home and some work on the boat in Coomera we kind of retracked back to the Whitsundays, trying to revisit the highlights we discovered last year. Surfing in Mooloolaba, wonderful diving at Lady Eliot island, island adventure and bird paradise at Lady Musgrave island and Lagoon. We also visited Yeppoon the place were the cyclon Marcia hit land only a month earlier. We have been told that the cyclon somehow made the butterflies go to some islands and at Percy Island we saw millions of them. Kate, running a little farm there in the mountains - 80 miles from the next town - gave us insights into her self sustaining life. Kate and her husband - not having a lot appart from a view sheeps and the farmhouse seemed to be more happy then many city people I met. At the Whitsundays we picked the highlights: Diving at the Bait Reef, Anchoring in the Hill Inlet at Whitehaeven Beach and climbing up the Whitsunday Peak. Townsville is a very pleasent little city with a beautiful table mountainlike granite mountain we climbed. We had a nice hike and nice snorkel at Magnatic island and then a wonderful diving adventure at wheeler reef - far out in the blue. Visibility was close to 30m that day. Rays, sharks and everything was present. On our way to Cairns we daysailed to some more islands and reefs and dived and snorkeled spots, where possibly nobody went before us. For almost one month we cruise in the Whitsunday Group in Australia. Little waves, persistent tradewinds, 100% sunshine and endless beautiful anchorages make it a dream destination. The wildlife experiances we had so far are extraordinary – turtles almost on every anchorage, kakadus, kangoroos, 1000sends of butterflies and fruit bats on our hikes to the island peaks and uncommonly big and tame fishes on our dives through various canyons and caves at the Barrier Reef. The temperatures in Australia makes sport like hiking, jogging or mountainbiking on deserted islands (almost all of them are uninhabited national parks) fun again and the advantages of civilzation are a real pleasure after cruising 5 years in very little developed countries. Highlights on the Solomons were very nice dives and hikes, beautiful anchorages (sometimes with crocodiles only a few meters away..) and mostly nice people (with occasional exeptions - money is of central importance to many Solomon people other than in PNG) Finally we found a cool kitesurfing island with the little flaw that no women were alloud on the beach. We were happy not to have had any problems with malaria or crocodiles on our PNG and Solomon adventure. After 2 month refitting the boat in Davao and a nice holiday at home we had a adventarous time in PNG. I never travelled a country so different to the rest of the world. Very poor but very rich as well. People were incredibly friendly - giving gifts without expectations was custom at every anchorage we have been. On bord were all timers like Torsten and Martin & Birgit as well as new crewmembers who soon became friends. Diving in PNG is ranked on my personal top3 of all my dives around the world. Our time at the Philippines comes to an end. We discovered 100reds of beautiful islands - people farming seaweed or living of the nature but always having a friendly smile for you. Very few places are spoiled by tourism - like Borocay - but they are the exeption. What all have in comon are a truckload of excited kids greating you on the beach when you land with the dingi. Obviously the big fish have all been eaten by the Filippinos but still a lot of beaty underwater is remaining from wrecks to caves and spectacular drop offs. I could practice kitesurfing since we had a lot of wind most of the times and my family and Stephie came visiting as well as Johan my french friend who helped initiating the Wild One Project. Know it is time to start the refit and maintenance of Wild One and prepare her for her trip to Australia in August 2014. Xmas we arrived at the philippines only 70 miles north ofwere the disatrous cyclon Hayan damaged a lot. Fortunately we did not see anytraces or damages on our way to Puerto Galleras. The cyclon seem to havedistoyed only a relatively small area and 100km from the centre it was merely astrong wind. In Puerto Galleras we spent new years. Actually most of us fellinto bed at around 10pm after an nice dinner in a resort since we sailedthrough the night before. On the way we explored little fishing villages andexperianced lots of friendly people giving us fish (a large Mahi Mahi) as a gift and lots of curious childrenaccompaning us on our stroll through the village. Underwater we find creatures and plants I have not seenbefore in my travels around the world also there are not too many big fishesaround. Actually every dive offers a little surprise after adjusting tomacroview. I am looking forward at my tour around the philippines – acountry the size of new zealand. Our days in divers paradise Palau are coming to an end. Believing that after Fakarawa no better dive would be possible I was wrong. Dive spots in Palau offer an incredible diversity of different fish all tame like in a zoo. Hard to focus on one thing making photos... You actually do not know what to look at first. Sharks, huge napoleons, turtles, octopus, huge swarms of jackfish, barracuda and other fish, caves, blue holes and wrecks from WW2. Beside that the landscape of the rock islands is stunning and within the best I have experianced so far. The last month we visited Pohnpei and Chuuk. Both islands are famous for their diving. In Pohnpei we dove with Manta rays while in Chuuk we could explore two japanese airplane wrecks from WW2. Now we are on our way to Palau – passing by the outer FSM islands we hopefully can visit as well. Long time since I foundinternet to write some lines. We are all well sailing in best weather off thecyclone belt. Though we have heard of the destructive cyclone passing to thePhillipines. Nevertheless we will stick to our plan since we planed to be atthe Phillipines in the cyclone free season. In the meantime we have arrived in themiddle of micronesia in Pohnpei. We collected unforgetable impressions ofuntouched culture in Abajang in the Kiribati Island group and found veryfriendly people in Tarawa helping us to fix our damaged headstay. We discoveredthe headstay almost broken beeing held only on four strands. Fortunately a sparestay was on bord and thanks to my Sail maker One Sails and Hagen a crewmemberarriving just in time the required spare terminal could be brought in and thedamage could be repaired without loss of time. We found wonderful diving atEbon Island (South Marshall Islands) with huge swarms of Jackfish and manysharks cruising around. Kosrae was also nice withfisherman passing by and bringing us yellowfintuna not accepting any payment. Oneof the best mooringsystem for divesites I have ever seen on this island. Thedinghy rides through the mangrove channels are also worth mentioning. Beatifulcoral but little big fish we have seen there. Although the authorities arereally nice and helpful the paperwork regarding entry and exit (entry permit inadvance, check in and out for each island and each anchorage with allauthorities – up to 7) and interisland traffic are enourmous, timeconsuming andvery expansive. Maybe one reason why we arethe only boat on most anchorages. On the other hand I guess that is one part ofan adventure like this. Tonga was a totally relaxed but still adventurous experiance. All in all a cruisers heaven with superb diving - wahle encounters and interesting and friendly locals. Depending on where we went we found next to no tourism in the hapai group or lots of cruisers but beautiful anchorages in the vava u group. Highlights were diving into some of the caves and swimming with some really big humpback whales for quite a long time. The sail to Samoa was harder than expected - the net broke and arriving in Samoa in the evening they did not let us go on land since we were not checked in and the authorities claimed there holy weekend. At least I could take my mountainbike for a little ride up the mountain there. We truly found Paradise at Palmerston Island. Not only because of the beatiful island, lagoon or the calm anchorage on the outer reef with wales, turtles groupers and clear water but especially because of the incredibly nice and special people we met. All in all about 60 locals called Marsters, all descendents from William Master who first settled here with 3 wifes, living on this island. Once you arrive, a Marsters will be your host and really take you on into their family and share what ever they have with you. A custom going back to 1860 set up by William. On the other hand sailors help where ever they can. Hopefully that wonderful place will be not spoiled by cruisers who abuse the locals hospitallity. August went on as it started – wonderful and adventurous. 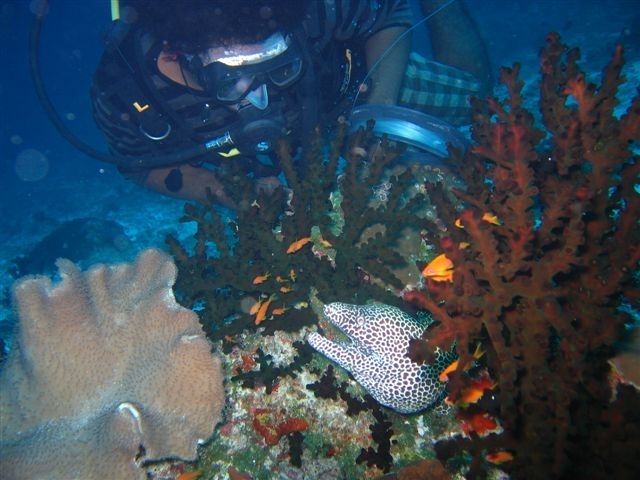 Super Diving at Beveridgereef – a well protected atoll without land nowhere close to an island. In a wreck there we cought a lobster. Could not be a better birthday dinner. Niue was a highlight as well with its wales, seasnakes and wonderful caves above and under water. I will not forget the whales who came by one night at the anchorage and stayed with us a few minutes very close to the boat as well as the turtles who were always around in Aitutaki. Another highlight were dolphins overtaking us when snorkeling at the outerreef in Hervey Island. Cook Islanders are super nice people who love their holy sunday. Again one moth passed in paradise! We have checked out today and leave the society islands. Next destination cook islands. Although the society islands were a bit more touristy I would not want to miss that experiance. We swam! with whales, mata rays, more than 40 eagle rays and dove with fat lemon sharks. Not forget to mention super kitesurfing and hiking on the picturesque mountaintops. A wonderful month with my parents, my girlfriend, Aaron from US and Thomas and Petra from Switzerland in the Marquesas went by very fast. We will not forget the wonderful hikes along sheer rockridges, the diving with mantas and the good food enriched by self picked exotic fruits (we made a guave, starfruit and stoneapplejam!) and spices (Aarons famous chilli paste) and moms self picked and pressed fruit juce. Internet again and some fotos! We arrived in Paradise in french Polynesia. Gambier Islands are so far off the track – we encountered incredible friendlyness of the locals, fruits everywere, nice hiking, paradise islands, super diving and nice surfing once the wind was up. A well earned reward after 6000 miles of sailing since panama. Now we arrived in the Marquesas! On our way up we had the best dive ever in the pass from Amanu atoll. Highlight was also my parents visiting for one month. February we sailed more than 4500 miles from Ecuator to Gambier Islands with only to stopovers at Easterisland and Pitcairn. On the passage we made good speed with mileages between 200 and 250 the first 10 days. After the wind dropped we fished a 1,5 meter swordfish. Most delicous fish ever! Easterisland was incredible and a real treat after that long passage. We came right in time to the Tiare festival - a dancing, sport and singing competition the whole island takes part and prepares the whole year for.Surfing and diving right from the boat and super mountainbiking. And not forget to mention the impressive statues! The ongoing passage was less pleasant with huge swell which made our Genaker break and little wind at the end. We sailed from Panama to Ecuator, left the boat there and traveled Peru by bus. On the passage Phil cought a big Marlin who decided to tear the line after a few seconds but showed of before by jumping completly out of the water. Machu Picchu left a huge impression as well as the snow covered mountains of the cordillera blanco. A long biketour up to a 4500m glacier was the highlight. Coming back to Ecuator unfortunateIy I found my Dingi engine stolen. Now we are at easter island – fotos follow soon! We were very busy doing the Antifouling on a secluded beach and changed the sealings of the saildrive and repaired the rudder. Now the boat is ready for its long trip over the pacific. We just checked out in Panama City and will leave to Lima / Peru tommorow. After 3 month we left the San Blas Islands. The cruising scene in Panama is really unique. A meeting point were everybody funnels or get stuck. I met 3 Austrian boats I knew before. The San Blas Islands inhabited and governed by the Kuna Indians and the rich underwaterworld left nice memories. We lived from lobsters and octopus, saw crodiles in dschungelrivers and hiked to waterfalls in the rainforest. Sharks, Rays, Baracudas and sometimes groupers often entertained us while snorcheling. Highlight was beeing a tourist in Columbia and visting the lost city -ancient remains of a indian city in the serra nevada only accessable via 5 day hike. Now we are sailing along the San Blas Island which stretch over 120miles along the Panama coast. Hopefully we make it to our island before darkness. Lots of reefs and bad charts in this area make eyeball navigation essential. Nice diving in Bonaire end of June and Doerte and Anne joined me on the trip over the rest of the ABC islands to Columbia. Two girls on bord and no bad luck at all - who would have thought so - no damages on the boat - and 3 fishes all in all. We discovered a wonderful anchorage in Curacau, did a lot of wrack dives in Aruba and I had a incredible kite and surf session in Cabo de la Vela in Columbia. Last two weeks we went back to all highlight spots from May in the Grenadines instead of heading to dangerous Venezuela and discovered some new amazing underwater caves in St. Vincent. You could swim into a crack with 1000snds of bats and dive out to a drop off! The anchorages in St. Vincent were all surrounded by steep volcano cliffs. The new 15hp dinghy engine gives us a lot of fun. Heading to a 1 mile distant dive spot in 5 minutes instead of 30 minutes like before opens up a whole lot of opportunities. Kitesurfing was a highlight as well so late in the season. We had steady 20kn and sun were we should have no wind and rain this time of the year. Enclosed I am sending some fotos again. Anyway we head to Bonaire today and will make a little stopover at Islas Aves just before Bonaire. In Bonaire Albrecht and Anna will head back to Austria and Dörte and Anne will come on bord. mooring. 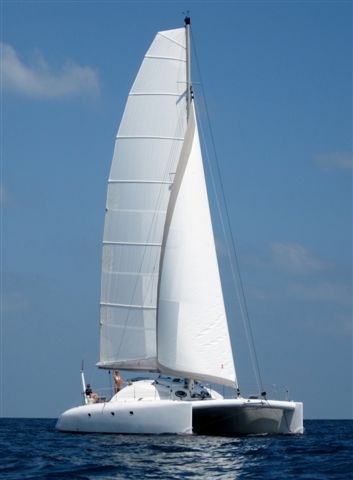 You can relax and unwind easily aboard the catamaran with her enormous deckspace, enjoy sunbathing, reading or just watching as the skipper comes zooming by with his kite or on a surfboard. All in all life is very easygoing and you yourself decide at which pace the day should be passed. Have a sundowner in the evening and enjoy a delicious meal afterwards - especially if you are as fortunate as we were, twice bing able to catch a Mahi Mahi on the way to the magnificant Islas Los Aves and then again shortly before our last landfall in Bonaire. For us these four weeks have meant the sailing experience of a lifetime. We came as guests and we left as friends! Thanks so much, Martin! Good luck and all the best for your future as you continue towards the great Pacific! "Fair winds, following seas!" to WILD ONE, her skipper and all the crew that will be joining their voyage! Arrived in Tobago on 28 March 2012 into the beautiful rustic village of Charlotville. Anchored at Pirate Bay then set about exploring the nearby areas. A hike up into the rain forest included an exciting encounter with a green snake busy sucking the juice out of an unfortunate frog, clearly irritated by being interrupted during his lunch. A few days were spent on land enjoying the local hospitality, meeting the mango man, the gancha man, the fish man and the music man, Spikey. Enjoyed a couple Carib beers while liming with the locals, and a night out sampling the local cuisine. After several patch jobs, Dodgy Dingie managed to hold out to the end of the month, with some very interesting floating techniques and beach landings. Snorkeled the Bucco Reef, a protected marine park and enjoyed diving at The Sisters Rocks. Swam to Pigeon Point, Tobagos most famous beach, to relax on beach chairs and sip ice cold beer. Took the local bus through to Scarborough to stock up on supplies, explore the botanical gardens, conquer Fort King George and sample the local Bob Marley reggae music. Sailed from Tobago to Trinidad on 1 April. Farewell dinner with top crew Felix, George & Mark at Power Boats jetty restaurant, Sails. A couple of quiet weeks in around the harbor allowed for a bit of repairs & maintenance, the successful purchase and resuscitation of our new Dingie Jesus, beach barbeque with the Brazilians at Scotland Bay, some great cycling trips exploring the lush green terrain and the exciting discovery of Channel 68 where trading trash for treasure at 8am in the morning, became a highlight. The new crew, Torstan, Joe, Ute, Werner & Urs arrived mid April and we sailed from Trinidad to Tobago on 15 April. Lots of diving at several different spots, including the wreck at Mt Irvane Bay, beach barbeques, delicious lobster dining, lots of freshly caught fish superbly prepared, Caribbean cocktail sundowners on top of Wild One, wonderful snorkeling, hikes to hidden waterfalls with swimming in rock pools and then it was sailing with dolphins from Tobago to Trinidad. A stormy overnight anchorage at Grande Riviere Bay, Trinidad allowed for the amazing experience of watching the leatherback Turtles, some in excess of 2 metres in size, lay their eggs. The last two weeks we sailed 1800 miles from Salvador into the Amazonas to Belem. We had short stopovers in Receife, Sao Luis and in a nice little offshore island called isla dos rocas with clear water and nice diving. We are leaving Salvador and heading towards Belem. 1500 miles to go in 12 days - Brazil is a large country! The two days Carnival were very impressive - never seen so many people in motion before! We managed to scrap our spinaker and could not catch a single fish!